During opening remarks for the 2016 SUNY COTE Summit, Alex Cartwright, SUNY Provost discussed the need for SUNY to explore micro-credentialing and badging. He noted that private institutions were using badging to recognize student achievement and SUNY institutions were missing out on an opportunity. At the beginning of the summit, it was noted that participants would be receiving a badge simply for coming to the summit. Additionally, other SUNY COTE badges were announced such as for participation in the Open SUNY community and for using social media at the COTE Summit. On the morning of the second day, the first presentation was dedicated to badging. Carla Casilli, a Badges + Digital Credentials Strategist gave a wonderful presentation: Making sense of the new world of digital credentialing. Carla noted that badges are digital representations of learning. The badge earner is at the center of the system. Badges also provide a way to capture informal learning. Badges can identify new pathways. They are an open door to learning. With badges, you can see the evidence for earning the badge. Badges provide a way to acknowledge learning throughout the process. People are completing a lot without necessarily completing a degree. There is lots of movement on badges from many different directions. For example, the Department of Labor looking at credentialing and badge on a larger scale. 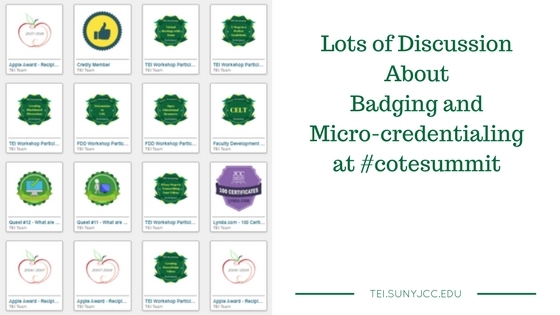 Last week, I gave a presentation on badging as it may apply to SUNY JCC. If you are interested in badging, please contact me. ← We Don’t Need No Stinkin’ Badges… or Do We?